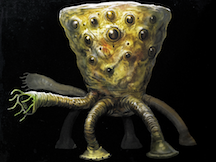 A sickly yellow, inverted cone-shaped enemy that is covered in eyes. A gaping, tooth-ringed mouth opens at the top and their multiple, suckered appendages make a hollow popping noise while walking. Too Many Eyes The chaos eater attacks two different targets with its appendages.